"Last year I spent time in Edinburgh and I visited the cafe where JK Rowling wrote some of Harry Potter and then I saw the Harry Potter shop at Kings Cross Station. It got me thinking – in popular culture, Halloween may be more famous for wizards, witches and dressing up kids as monsters, but there is more to it than that. "I gave it some thought and designed the Meaningful Treat Pack as part of a campaign which aims to reclaim the positive messages of the Eve of All Saints (Halloween). "The Meaningful Treat Pack is designed to help with mission work on, and leading up to, the Eve of All Saints. It is suitable for Light Parties, outreach events, schools or for children who call to trick or treat on 31 October. "Inside each box there are 30 packs and a free activity ideas sheet to help you plan an event. "This is the first time a pack like this has been available and it is a chance to engage and encourage the journey of faith. It is a similar approach that we have taken with our Real Easter Eggs and Real Advent Calendars. "We have had lots of orders for the packs over the past month from all sorts of people. Scroll down to read more about the Meaningful Treat Packs. We are also offering free delivery on packs purchased in September (they come in boxes of 30). You can buy your box here." To celebrate the launch of the Meaningful Treat Pack it has been revealed that sales will help support the ‘Jesus Light' which will appear at Blackpool illuminations from this September. For every box of Treats purchased 50 pence will be donated to the Jesus Light at Blackpool illuminations. The Jesus Light will be seen every year by an estimated 52 million people over its 15-year lifespan. It is 15ft tall by 10ft wide and shows a dark Good Friday cross which transforms into a resurrection scene. Rev Cox, who is coordinating the Jesus Light project, said; "We welcome the desire to shed Christ's light at Halloween and to partner with sharing His life through the Blackpool Illumination." Inside each Meaningful Treat Pack there is a bag of Swiss Fairtrade milk chocolate buttons and a Challenge Activity Poster. The poster has eight challenges using the themes of good winning over bad and light over darkness. The challenges include a quiz, a word game, a Bible maze, a call to buy Fairtrade, a suggestion to say a prayer, a national hero competition with a prize, and a challenge to give a treat to someone less well off by donating to a children's charity. Each box costs £30 (there are 30 packs per box – £1 per pack). Each box also includes an ideas sheet for leaders. Quite often people feel that there has to be more to Halloween than dressing kids up as serial killers or monsters. 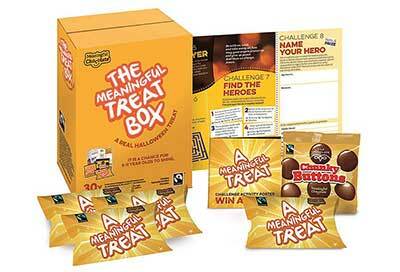 The Meaningful Treat Pack is a way to challenge kids to look at the good in the world, to do a bit of good by giving to a charity and to enjoy some great Fairtrade chocolate. It is a chance for 5-11 year olds to shine this Halloween. This is the first time a pack like this has been available and it is a chance to engage and encourage the journey of faith. It is a similar approach that Meaningful Chocolate Company have taken with their Real Easter Eggs and Real Advent Calendars. There is free delivery if you order by the end of September, but as there are limited stocks we advise ordering now. You can buy your Meaningful Treat Packs here. You can view the Challenge Activity Poster included in each pack here. You can read more about the Real Halloween Campaign here. View the Meaningful Treat YouTube video here.